Deputy Prime Minister of Italy and Interior Minister Matteo Salvini visited Moscow to take part in an event, organized by Confindustria Russia, an association representing and supporting Italian companies operating in Russia. On Wednesday at a conference entitled "Russia-Italy: Challenges and Perspectives of Economic, Industrial and Commercial Cooperation" Salvini criticized anti-Russian sanctions, while also commenting to Sputnik about the results of the recent elections in Bavaria, where Angela Merkel's main allies suffered a historic defeat. Sputnik Germany was able to talk personally with Salvini and get his opinion about the recent elections in Bavaria, where the Christian Social Union (CSU) – one of Merkel's partners in the ruling coalition — received only about 37% of the vote. For a party accustomed to having an absolute majority in the Landtag of Bavaria [Bavarian Parliament], the result was considered to be a defeat: the last time support for the CSU was this low was in 1950. Additionally, the parliament will have among its ranks representatives from the party Alternative for Germany for the first time in history. “Almost all parties in European countries that were in power for decades are now experiencing a wave of defeats. This happened not only in Germany, but also, for example, in France, and it is already a pattern. Those who are referred to as 'populists' are actively consolidating their positions. We need to create a new Europe, a Europe that guarantees the development of the economy, real freedoms and safety,” he told Sputnik. As the conference centered around the challenges and prospects of economic, industrial and trade relations between Russia and Italy, one of the topics mentioned by Salvini was the possibility of lifting the sanctions on Russia. “Europe should think constructively. Italy has lost €20 billion due to this sanctions war. We are waiting for a signal of willingness to engage in dialogue, but I got the impression that EU leaders want to continue going all the way with sanctions. I am absolutely unsatisfied. There is no point in sanctions. For my part, I will do everything I can to contribute to the lifting of the sanctions on Russia,” Salvini promised. “If the European authorities make a proposal to extend the sanctions, Italy will respond with an absolute refusal,” the deputy PM said. The deputy prime minister additionally made public his thoughts about the conflict between the Russian and Ukranian Orthodox churches. “We [the EU] have invested €15 billion in Ukraine in recent years. I was terrified when I read that there could be a religious war between Russia and Ukraine, the Russian church and the Ukrainian church. Religious wars have never done anyone any good. 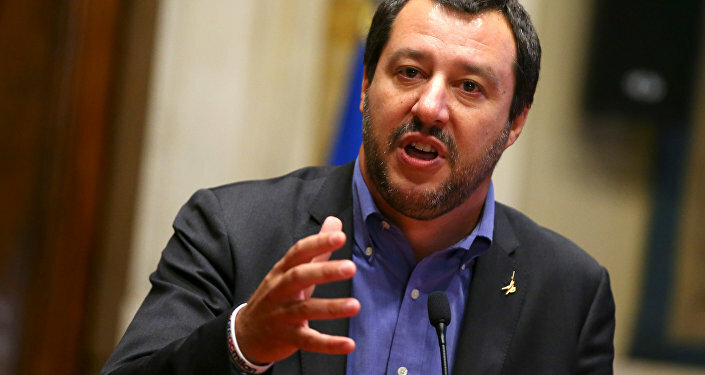 We know from history when political leaders interfered in religious affairs nothing good ever came out of it," Salvini said, noting that the Italian media had failed to properly cover the conflict over Ukrainian autocephaly. “For some, if you work with Russia – you’re almost a criminal. Recently we have seen some mythical stories about spies who poison other ex-spies. It all sounds quite unconvincing” — Salvini added. While Matteo Salvini’s visit to Russia has been viewed positively in Italy, a visit by federal state Prime Minister Manuela Schwesig from Mecklenburg-Vorpommern (Germany) to Moscow at the invitation of a Russian-German forum has already managed to stir controversy in the German press. Russia's permanent representative to NATO and former Deputy Minister of Foreign Affairs Alexander Grushko told Sputnik that it would be “foolish” not to admit that Russia and the rest of Europe share a historical and cultural background and that this should be used to improve political, economic and cultural relations. “These meetings are intended to promote bilateral cooperation, to move to a more optimal form of economic cooperation, so I just do not understand people who tend to oppose them,” he told Sputnik Germany.